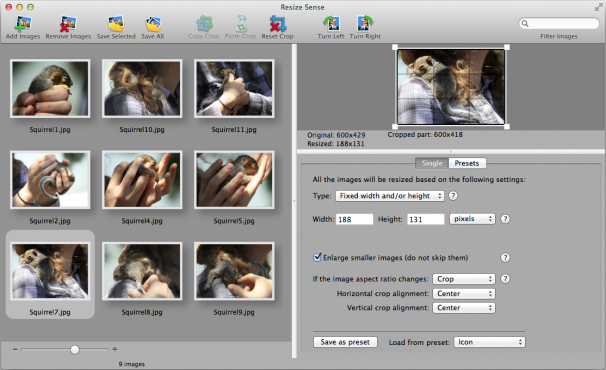 VeprIT’s Resize Sense (Mac App Store link) is an all-in-one batch resizer and cropping tool that will save both time and tedious labor in getting one image—or hundreds of images—to exactly the right size for webpages, email, and layouts. Resize Sense’s tri-partite single-window interface is clean, and the panes are an unobtrusive gray color, which makes it easier to concentrate on your images. The toolbar contains all the basic controls for adding and removing images, saving images, copying, pasting, rotating, or resetting crops. The app also has a full-screen mode and a search box. There are numerous ways to change the size of your pictures with this app, and in many cases, you can do so without having to change the composition. However, some settings (fixed width and height and fixed dimensions) will change the aspect ratio or distort the image in order to achieve the size you specify. The “Crop the image to avoid deformation” control offers a choice of cropping the image or reformatting it to fit your specifications. The left pane is essentially a browser window containing the images you’re working on. It can handle a single image or multiple images simultaneously. You can vary the size of image previews in the browser pane with the slider bar. If you change your mind about including an image you imported into the browser window, just select one or all and hit the Delete/Backspace button on the keyboard. You can also manipulate images in the browser with a right-click of the mouse. The right side of the window, within the preview and configuration panes, is where the bulk of the resizing action takes place. The heart of the program is the configuration pane, which offers two resize modes: single and presets. Single mode presents seven methods that you can use to resize images, first of which have to do with fixed dimensions. Fixed width and/or height and fixed dimensions are similar in that you tell the program what size you want the image to be. The fixed dimensions option assigns either a horizontal or vertical orientation based on the original image. Fit to width and/or height and Fit to dimensions are also similar in that you can define the new size by both dimensions or let the program judge which orientation the image will have based on the original. Longest edge and shortest edge let you define the new size according to these two measurements. Finally, the Crop only option lets you freely crop (and straighten, up to 45 degrees) with a defined aspect ratio. You can copy your crop and then paste it onto additional images, making the program a batch-cropping tool in addition to a resizing tool. Certain images, inevitably, will be resized as larger than their originals; the program can accommodate these, if you check the box that specifies enlarging smaller images. However, the program does not have editing features that allow you to up-sample photos, so it’s best to use this feature judiciously. You can also choose to let the program ignore images that are too small for the designated size. Resize Sense can also intelligently add white space and borders in custom colors around an image so that you can avoid cropping or changing composition when resizing. Resize Sense comes with only two built-in presets, but a size presets management dialog box lets you build your own reusable presets according to your specifications. You can then apply multiple presets to your images. You’re never surprised at the results you get from Resize Sense because the adjustable preview window visually indicates what a given action will do to your picture’s composition. You can specify exactly where resize or crop actions will take place in the image (left, right, center, top, or bottom) in order to achieve the best-looking size adjustment. Naming a batch of resized images can be a hassle, especially if you never bothered to name your images in the first place. Resize Sense solves the problem with an automatic naming convention involving predefined tokens and custom text—including file name, preset name, width, height, and sequence number. This system works well because you can identify an image and its size at a glance. In terms of performance, the app works quickly; it took about a minute and a half to import 116 high-resolution images from my 12-megapixel DSLR into the program. Of course, a batch of lower resolution images came in a lot faster. The program gives a warning when a user adds more than 500 images at once, and will not add more than 2000. The program supports five basic image formats, including JPEG, PNG, TIFF, GIF, and BMP. For JPEGs, you can also vary the image quality. Regardless of the size of your images, there’s a handy note on the preview pane telling you the size of the original and cropped image, and clickable help buttons (with question marks) in the configuration pane to remind you of what all the controls do. Note that there is a slight difference between the Resize Sense version distributed on the VeprIT website and the one purchased from the Mac App Store, because of Apple’s Sandboxing rules. 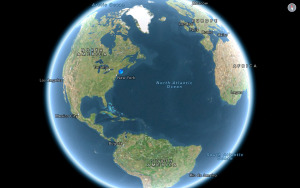 To save image files with the App Store version, users must point to a location via the system Save dialog and must select the target folder each time when saving multiple files. In the full version, you can save images to their original location or to targeted folders on your hard drive.